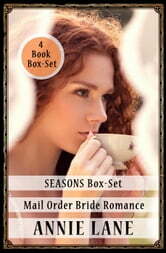 All four Seasons Books in one Box-Set! Charlotte's Summer – "…is a delightful story and it was well written, clean and a sweet romance. The characters were precious, especially little 'Junior'". Falling for Beth – "I must say I really love this author. She puts a lot of heart and soul in her books." Alice in Winterland – "Has to be the best of the brides that I read. Humor, gossip, secrets and love." Spring Belle – "This was a fabulous series." Annie Lane writes sweet stories filled with great community spirit, adventure, quirky townsfolk, and of course plenty of romance and weddings! Be sure to catch up with the next generation of townsfolk in "Seasons Sons & Daughters" Series # 2. Just like the first 4 books, it too is set in Conrad, however, 10 years have gone by. Doc Lawson's six children are now just about all grown up, and so too is the garrulous & handsome Earl "Junior" Mason. It's now the youngsters' turn to experience the joy of love and marriage. Matchmaking & mail order brides (and one lucky husband) seem like just the ticket! After all, it worked out just fine for their parents -- what could possibly go wrong? Catch up with the original Seasons brides - Charlotte, Beth, Alice & Belle; their very lucky husbands - Thomas, Earl, Gabe & Simon 'Doc' Lawson; Sheriff Calhoun & his pie-baking wife Louise & the ever-listening & ever-watching, Miss Mabel Clay. Meet new folk too - like Mr. Morton Campbell, a newspaper man with a very theatrical flair.